These days, it seems something is always the new something else. You know, Thursday’s the new Friday, brown’s the new black, Palin’s the new devil, Obama’s the new Messiah, etc. But to me, for example, comparing the pain and anguish at dragging myself from bed on a Friday morning after a few drinks the night before, to how relaxed and comfy I am sleeping late on a Saturday after the same number of drinks, makes at least some these kind of comparisons not only facile but downright misleading.The simple fact is that everything that’s around today is not somehow a better, newer and shinier version of something that came before. It’s just not true. There are, however, exceptions to this rule: computers are better than they ever have been, and I think, the same can be said of socks. Socks with lycra in them are so much better than those ridiculous, loose bags of yesteryear that never failed to cause blisters, and somehow managed to work their way down your legs and almost off your feet even as you walked around in shoes. There are some things though, that have always been good, always been recognized as good, even if only by a few, and whose quality has been continuously improved throughout the years in line with improvements in technology and ingredients. Amongst these is the very delectable French aperitif wine, Lillet. In 1872, the brothers Paul and Raymond Lillet founded their Compagny des Freres Lillet, and though they didn’t sell their first bottle of “Lillet – aperitif de Bordeaux” until 15 years later, it has been flying off the shelves world-wide ever since. The Deuxieme Empire (2nd Empire, 1852-1870) was a great boom time for France both as an importer and exporter of goods, and it was during this period that Bordeaux first led the world in the wine trade. Not only were the techniques of production and bottling of quality wines being revolutionized, but local vintners began blending these wines with a wide variety of exotic spices and other ingredients arriving from the French West Indies, Brazil and West Africa to make all kinds of tonics, liqueurs and aperitifs that quickly became vogue in French cafes.Made from 85% white Bordeaux and 15% fruit liqueurs juices (sweet & bitter oranges) and quinine, Lillet originally had something of a bitter flavor to it and was promoted under the name “Kina Lillet” as a tonic – kina, or kina kina (or chinchona) is a tree native to Peru and quinine is derived from its bark – with the tagline: “…a potent tonic. It can be consumed, for their utmost benefit, by those with a fragile constitution whatever their age.” Indeed, a double-strength quinine version was sold in the French West Indies and United States for a time and drunk by malaria sufferers. However, Lillet was really advertised until the turn of the century when it really took off in Paris. To this day, there is a considerable trade in the beautiful Art Deco advertising memorabilia produced at this time with venerable Lillet-branded pencils, fans, postcards, thermometers and posters all still changing hands among collectors. 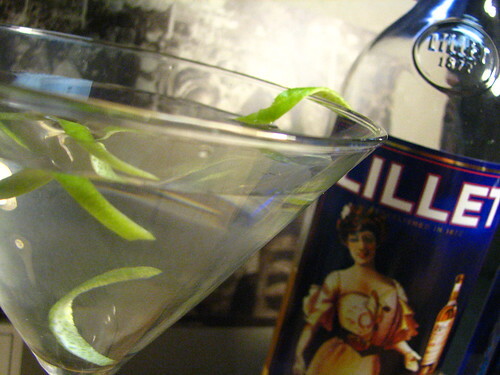 Then, as with pastis, the prohibition of absinthe in 1915 helped increase the popularity of Lillet throughout France, but it only really began to gain an international reputation in the interwar period when English drinkers found that when mixed with gin, in place of dry vermouth, it produced a rather toothsome martini. In fact, though it was subsequently superceded by the rather more prosaic vodka martini (shaken, not stirred), the Kina Lillet martini, as those of you who’ve watched the recent movies Casino Royale and Quantum of Solace will know, was James Bond’s drink of choice. Three parts of Gordon’s gin, one part vodka, and 1/2 measure of Lillet, shaken vigorously with crushed ice and served in a champagne flute with lemon peel, which Bond names “the Vesper” after his love interest at the time. And, while Bond may have cornered the market in refined style, Lillet blanc (as opposed to Lillet rouge, a sweeter red version, created in 1962) can be enjoyed in different many ways. Straight up over ice with a slice of orange or twist of lemon is very typical and refreshing, but a number of famous cocktails including the zebra square and Edith’s fizz also showcase Lillet’s talents as a mixer. It’s worthwhile noting that during the 1990s Lillet changed its recipe, and in 1997, after 110 years of following the same ratio of ingredients, the amount of quinine was reduced, and almost overnight, it became the number one drink in Parisian restaurant chain L’Ecluse with 12,000 drinks served that year. Anyone who has drunk neat tonic water can figure out why its popularity suddenly exploded. With the bitter aftertaste reduced the aromas of candied orange, honey and apple come through on the drinker’s palate like never before, and it’s probably no coincidence that even the rugged James Bond has returned to Lillet martinis now they are a little less astringent. But don’t give in to flashy modern advertising and let some buff dude in a tux convince you to try Lillet, engage your thoughts in the drink’s fascinating history, intriguing flavor profile and retro-bottle design, and you’ll quickly see that la plus ca change, la plus reste la meme. 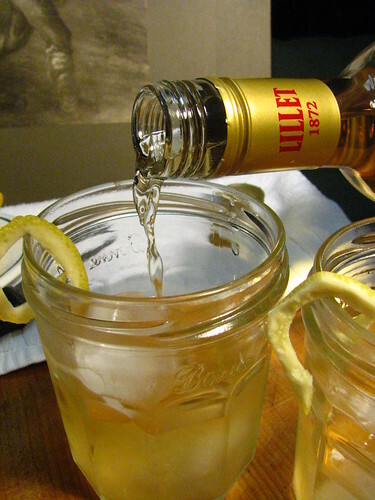 I very recently went out to dinner with a friend who was drinking Lillet and I was intrigued. I ended up ordering the same. They just served it really cold in a wine glass and I thought it was awesome. I’m hooked! Always happy to try a new drink! Finding it here might not be so easy but I’ll keep an eye out for it. Nice write up–lillet aint nothing that really the buff guy in the tux might even get me to enjoy (not just drink) chartreuse. Sweet!! lillet was such a big part of my youth! Dad was a big fan. It is yummy. I have always loved Lillet, nice post giving this fav some air time. Jonny & Amy, hope you’re having a blast across the pond…wish I could hoist a glass with you both. I’ll look for Lilllet as I’m always up for imbibing a new drink! I’ve never tasted lillet. Thanks for all of this history. I love learning about new ingredients. And I love that you served the drink in an old jam jar. I received a margarita in an old ball jar at a Mexican restaurant once and have been obsessed with drinking cocktails in canning jars ever since. hey strangers. sure has been a while! did you ever try anything from the cookbook?? great post. love that ur drinking out of jars! ur like the 4th post I’ve seen in the last two day where we talk about French food and spirits. I just did one, too, on warm fruit I had in the Loire region. 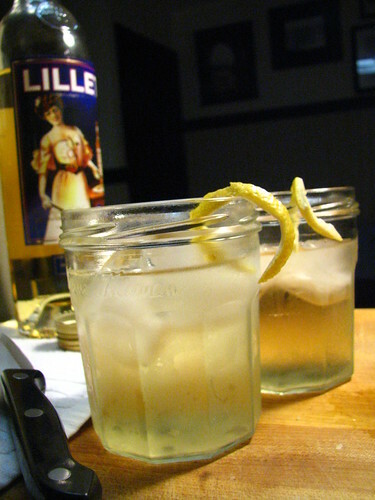 I had Lillet for the first time when I was working at a relais du silence in Northern Ontario. We used to chill a bottle ice cold and travel across the lake for a picnic of house smoked ham and gruyere sandwiches, along with anything else we could pilfer from the fridge. Oh, good times. Cool post… I haven’t tried it, but I must now! Thanks for the great comments! we’re back from a long trip back to england and will hopefully respond to comments later this weekend. rosesep (my mother) – thank you for two comments! you’re learning to use the computer so well now… big hugs! First time I drank Lillet was the summer of 77 and I ended up playing strip poker while listening to old Broadway show tunes. I had it again last summer with the same people. It was just as divine then, but we kept our clothes on. Hey, great article. I’m studying abroad in Bordeaux at the moment, and knew they were famous for wine, but didn’t know about Lillet until having stayed there for a couple months. I made sure to bring a bottle back for Christmas – a sweet stocking stuffer if I ever tasted one! Mary/Ben – thanks for your vignettes about lillet. I have no similarly interesting experiences to compare it to, but I do love hearing these tales from our diverse readership! Lillet is my favorite aperitif. My husband always gives me a bottle on my birthday and Christmas and I hide it and keep it all for myself. Oddly enough, I have trouble finding cafés and bistros in Paris that serve it. Alas, I miss the original Lillet. To my palate, the new, lighter, sweeter version pales in comparison. Then again, I am fond of Suze, which is quite heavy on the gentian and, sadly, nearly impossible to find in America. Didn’t like Gin. Lillet —shrug. Beyond description.. Not a Martini. Something different. it HAS to be the liquors mentioned. Spectacular. @Roger Galway: they aren’t half-bad are they? It’s only a Wednesday, but I could go for a Vesper right now.